Naruto Shippuden: Ultimate Ninja Storm 3, known in Japan as Naruto Shippuden: Narutimate Storm 3 is a fighting game developed by CyberConnect2 as part of the Naruto: Ultimate Ninja video game series which is based on the successful Naruto manga by Masashi Kishimoto. It was released by Namco Bandai Games on March 5, 2013 in North America and March 8, 2013 in Europe. It was released on April 18, 2013 in Japan. The game has 80 playable characters including several new, making it the largest cast in the Ultimate Ninja series. The fighting system has been modified, with the Awakening Mode, a state that gave each character enhanced abilities when their health was low, being possible to be used at anytime during a fight, for certain characters. As in the previous games, the player can choose two characters to assist the player character in battle. The assisting characters now can also aid the playable one through the use of thirteen different types of combos. Additionally, the assistants have health bars, losing health whenever they get hit, ultimately being unusable when their health bars deplete. Several arenas have become interactive, making the player automatically lose a fight if they leave a specific area. 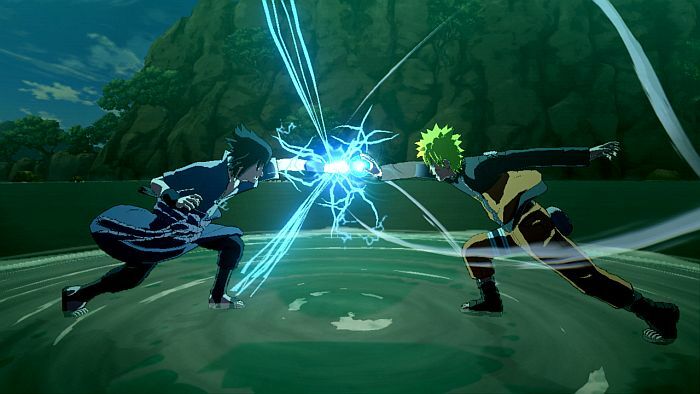 The story mode is similar to that of Naruto Shippuden: Ultimate Ninja Storm 2 rather than the previous game Naruto Shippuden: Ultimate Ninja Storm Generations as it features boss battles that include quick time events and require the use of strategies to defeat the opponent. The plot starts off by following the ending of Ultimate Ninja Storm 2 but it first focuses on the Nine-Tailed Fox attack to Konohagakure (The Hidden Leaf) with the player first controlling the characters defending the village. From then the game also covers the events from the series’ world war adapting past the episodes aired on television by the time the game is released. Thus, Tobi’s real identity is never revealed in-game and the War is temporarily won by the Ninja Alliance.It also includes the “Ultimate Decision Mode” which gives the option to change the result of the battles. Additionally, the game has mob battles in which the player controls a single character that has to battle a series of enemies. Wikipedia®. Trainer for the fighting game Naruto Shippuden: Ultimate Ninja Storm 3, you can use it to activate these essential Cheat Codes: Infinite Ryo, Max Hero Experiences, Max legend Experience, Super Speed, Super Jump, Infinite Health, Infinite Chakra, Max Chakra Capactiy, Infinite Items. Note: This cheat tool is for the original version v1.0 -v1.1 (Update 1) of the game Naruto Shippuden: Ultimate Ninja Storm 3.